STARTED IN 2002, CYPRESS AUTO CENTER OPENED ITS DOORS TO THE GREATER AUBURN AREA. SPECIALIZING IN THE HARD TO FIND DIESEL PICKUPS. OVER THE PAST 16 YEARS WE HAVE BECOME WELL KNOWN FOR OFFERING THE MECHANICS CHOICE MODELS ONLY. AT CYPRESS AUTO CENTER WE FULLY RECONDITION ALL OUR TRUCKS TO INCLUDE EXTENSIVE FRONT END WORK, TRANSMISSION SERVICE, TOP SHAPE BRAKES AND TIRES, ALIGNMENTS, FLUID CHANGES AND MORE. WE EMPLOY THE FINEST DIESEL MECHANICS IN OUR NEWLY EXPANDED; OPEN TO THE PUBLIC, SERVICE CENTER. OUR SERVICE CENTER IS NEXT DOOR TO OUR LARGE SHOWROOM AND DISPLAY AREA. WHEN YOU BUY A VEHICLE FROM US, REST ASSURED IT IS ROAD READY. WE ARE PROUD MULTIPLE WINNERS OF THE BEST OF THE BEST AUTO DEALER AWARDS. WE ARE NATIONALLY KNOWN SERVING MANY OUT-OF-STATE CLIENTS DUE TO OUR HIGHLY COVETED INVENTORY. WE OFFER A FULL RANGE OF FINANCE OPTIONS INCLUDING CREDIT UNIONS AND MAJOR BANKS. COME EXPERIENCE THE CYPRESS AUTO CENTER DIFFERENCE. A FIRST CLASS DIESEL TRUCK OPERATION. 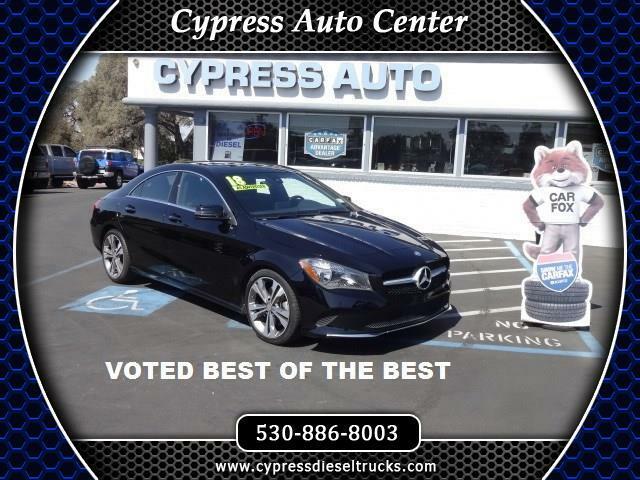 WWW.CYPRESSDIESELTRUCKS.COM (530)886-8003 Visit Cypress Auto Center online at www.cypressautosales.com to see more pictures of this vehicle or call us at 530-886-8003 today to schedule your test drive. Message: Thought you might be interested in this 2018 Mercedes-Benz CLA-Class.